Alison draws on many years' experience in researching natural remedies and products to use for health, home care and cleaning in her Hubs. How to get rid of the fruit flies (or vinegar flies as they are sometimes called), that seem to multiply rapidly out of nowhere, wherever fresh fruits or vegetables are placed (if not refrigerated). 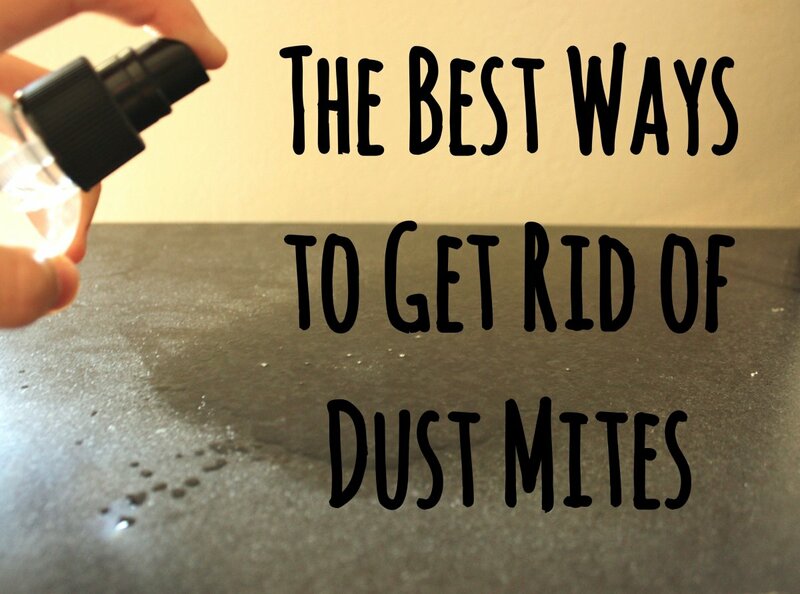 The best ways of getting rid of these pests with the minimum of fuss, maximum efficiency and zero chemicals! Completely preventing fruit flies can be almost impossible, but you can greatly reduce the likelihood of a plague of these little pests by taking a few simple steps. Read on, to find out how. The principle of making any trap for fruit flies is to have a container to hold some suitable bait or attractant and a means of making it much easier for them to fly in, than to fly out again. Ready Made Fly Traps May Be More Attractive? 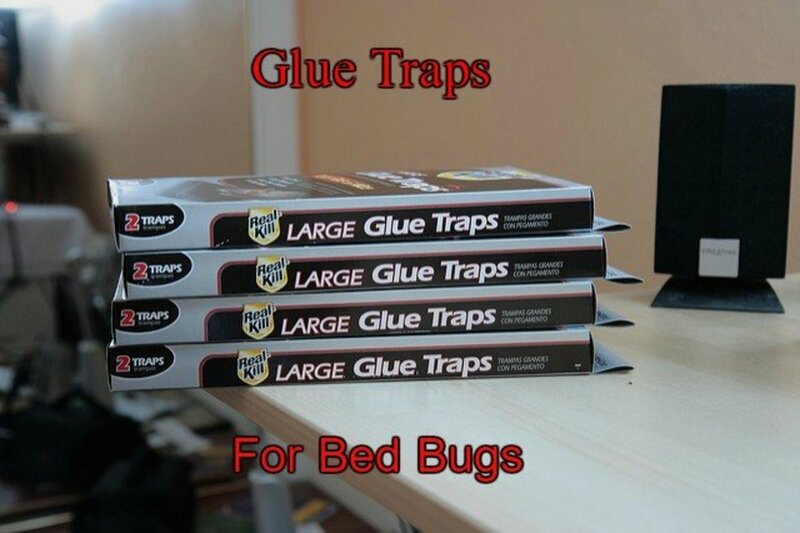 Traps can be bought quite inexpensively in a variety of styles and designs that may be more attractive on your kitchen counter or dining table than a home made version. 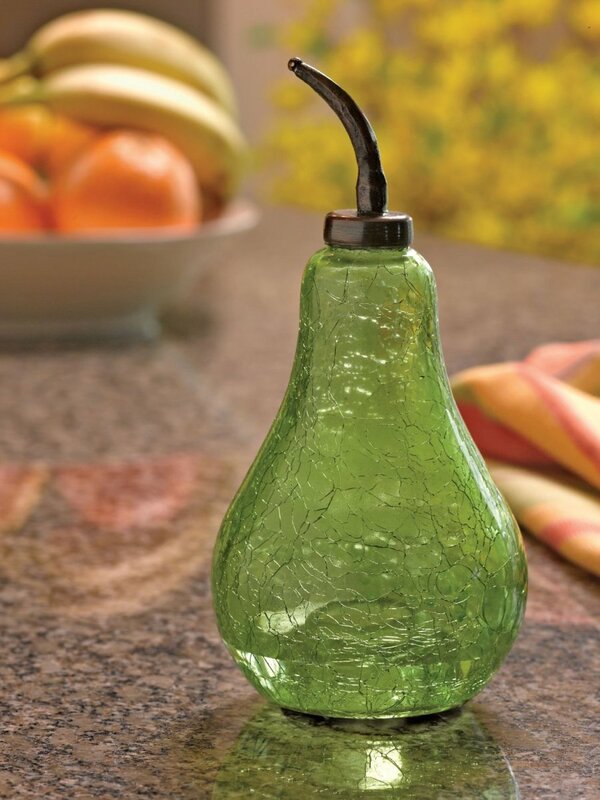 The Green Pear Fruit Fly Trap (pictured below) is a good example - although they are no more effective than the simple traps I show you how to make (below the picture). Below, I have highlighted several different, but very effective ways of creating a trap that will work continuously to get rid of fruit flies in the kitchen or elsewhere in the house. The simplest trap of all is a tall wine bottle or similar with no modifications at all. 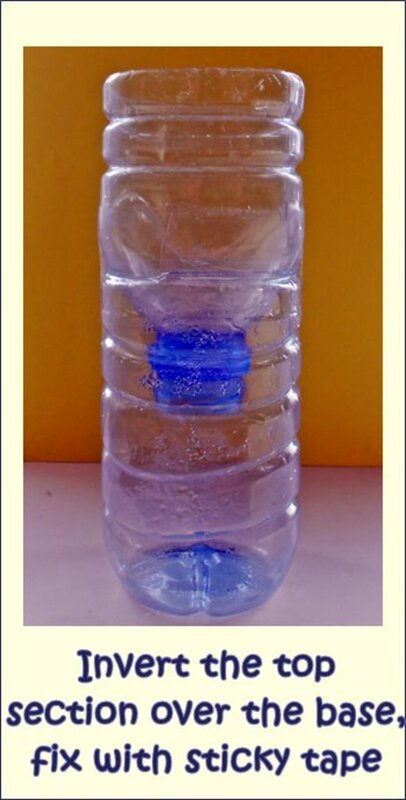 The success of this method depends on the bottle having a narrow neck through which the flies enter and are attracted down to the base for the bait. Surprisingly, very few find their way out again! 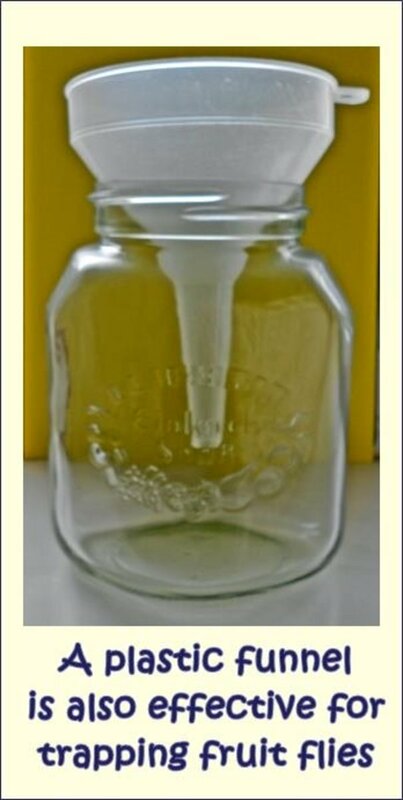 See the slideshow above for step by step pictures of the process for making a homemade fruit fly trap. 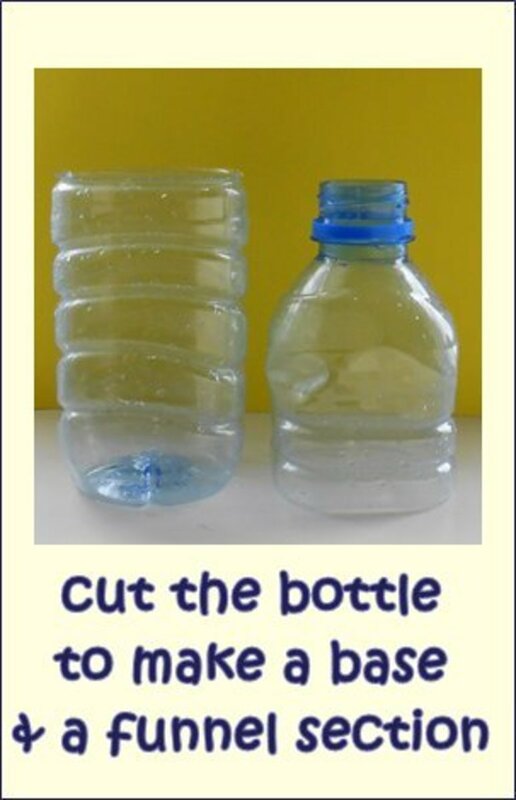 By cutting round a plastic soda bottle so that you have jar shaped section and a separate section ending in the pouring rim. 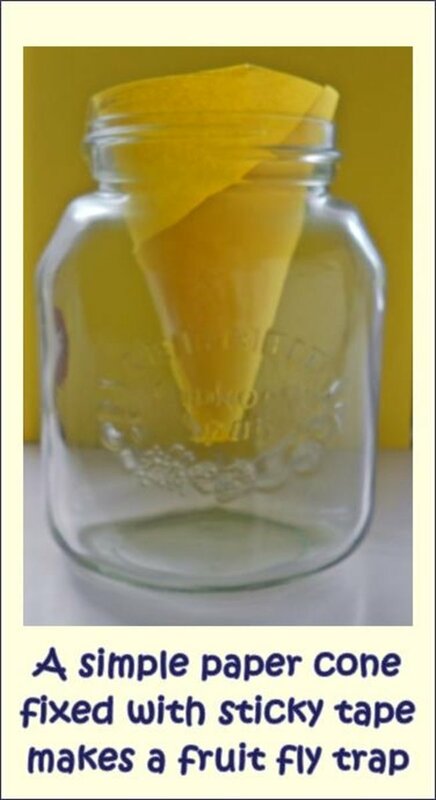 Invert the pouring rim section to form a cone and stick this onto the bottom piece of the bottle with sticky tape. Alternatively use a suitable container which you make a paper cone to fit. The cone should be the same diameter as the container at the top and not large enough to reach right to the bottom of the container so that it does not sit in whatever you decide to use as bait. Once you have placed the bait in the trap, simply fix the cone in place, attaching it to the rim of the container with sticky tape. You could eliminate the need to make a paper cone if you have a suitable plastic funnel to use on your container. 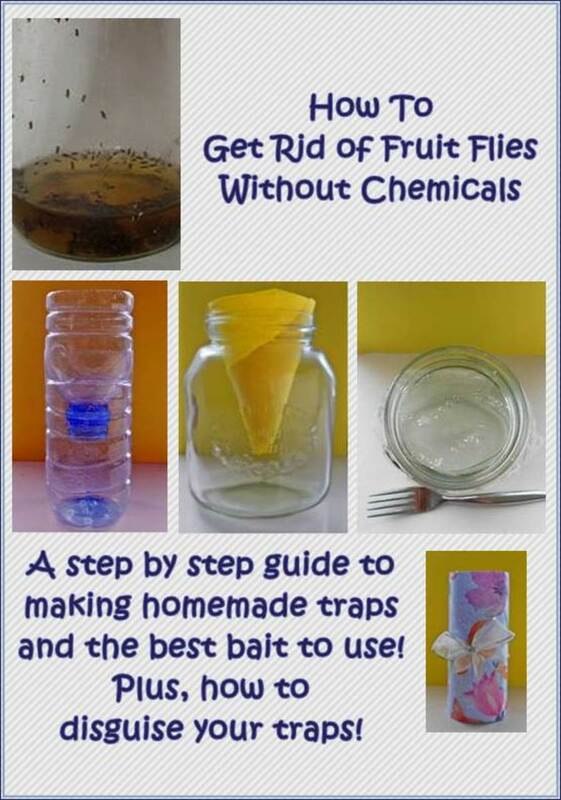 Hiding the Contents of Your Fruit Fly Trap! If you want to make your traps inconspicuous (and conceal the contents), you could cover the outside in pretty paper or fabric or use a ceramic container. Instead of making a cone for your chosen bait container, cover it with plastic cling wrap such as saran wrap as demonstrated in the video below. Puncture this with several small holes. The flies will get in, but will not be able to get out again. 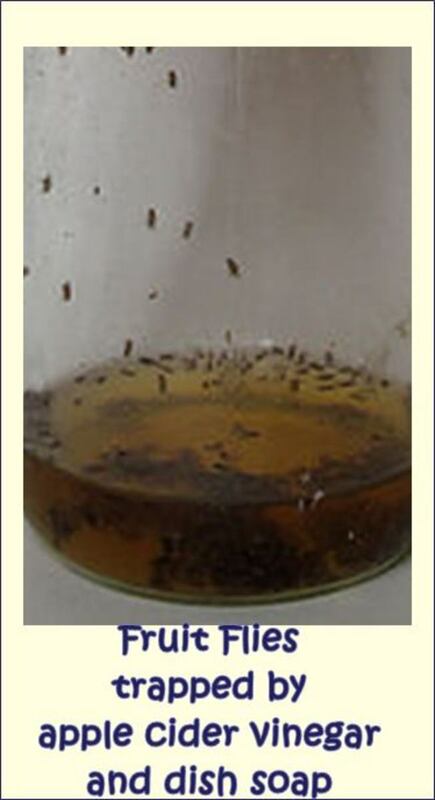 What is the best bait to use in a fruit flies trap? After much research and trial, I have found that the very best bait to use is apple cider vinegar - this is widely available but if you have problems sourcing it locally, you can get it from Amazon - see picture and link below. This works perfectly well on its own, but I prefer to add a tiny drop of dish washing soap to the surface to make the trap even more effective. What the dish washing soap does, is to break the surface tension on the liquid vinegar so that when the flies land on it, they sink into the vinegar and die. 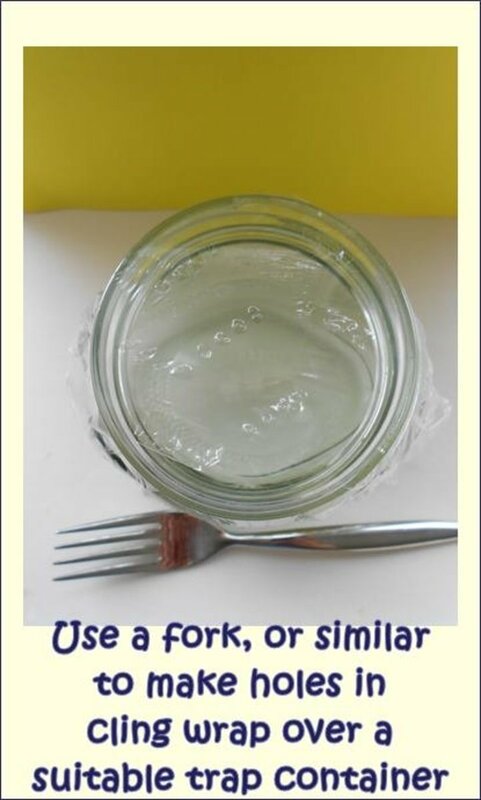 If you are a kindhearted soul with a love of all God's creatures - including fruit flies, you may prefer not to do this and add only a teaspoon of vinegar in your trap and no dish washing soap. 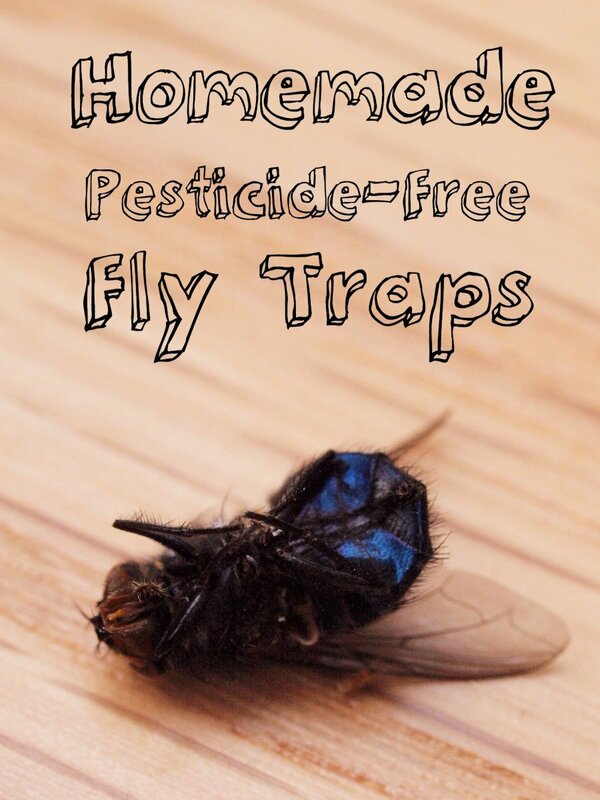 This will result in the flies remaining alive in the trap and you can then release them outside, away from your home. Second to the apple cider vinegar is a little left-over wine. This goes 'vinegary' anyway if left exposed to the air and the last 'dregs' left in a wine bottle work perfectly as the second best way to get rid of fruit flies! Some people like to use over-ripe fruit in their traps but I feel this could be counterproductive, especially if you forget to attend to the trap for a few days. 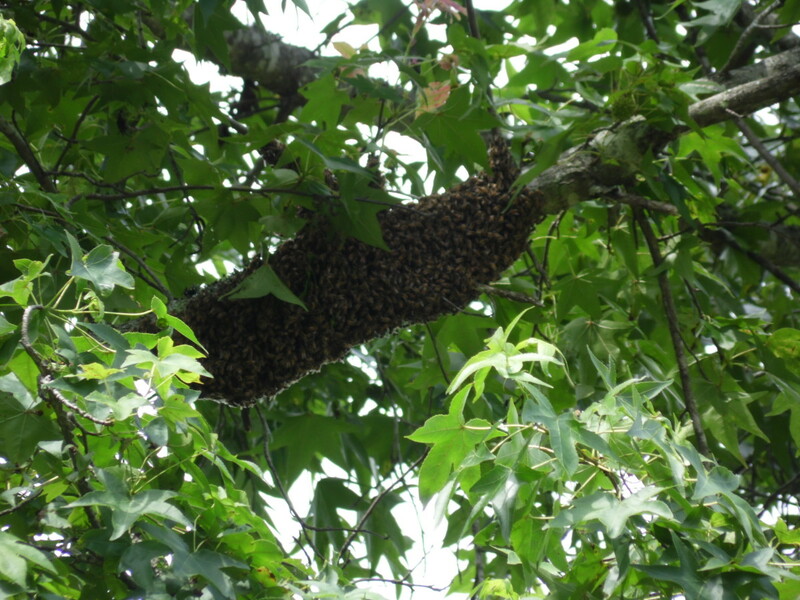 Adult flies will definitely be attracted it, but they could lay eggs on the fruit and cause a re-infestation. 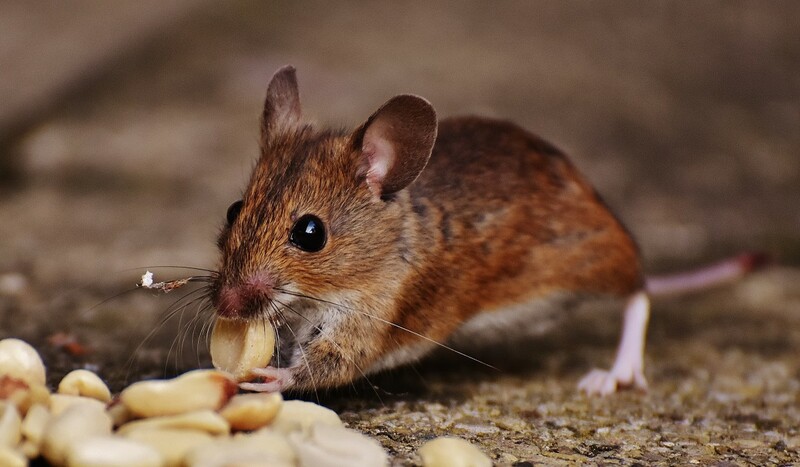 The second step in eliminating these pests from your home is to prevent future infestation! First of all, make your home much less hospitable to Momma fruit fly raising a family! Fruit flies lay as many as 500 eggs at a time and with the entire lifecycle only taking just over a week, you can imagine how many flies you could end up with if they are allowed to breed. 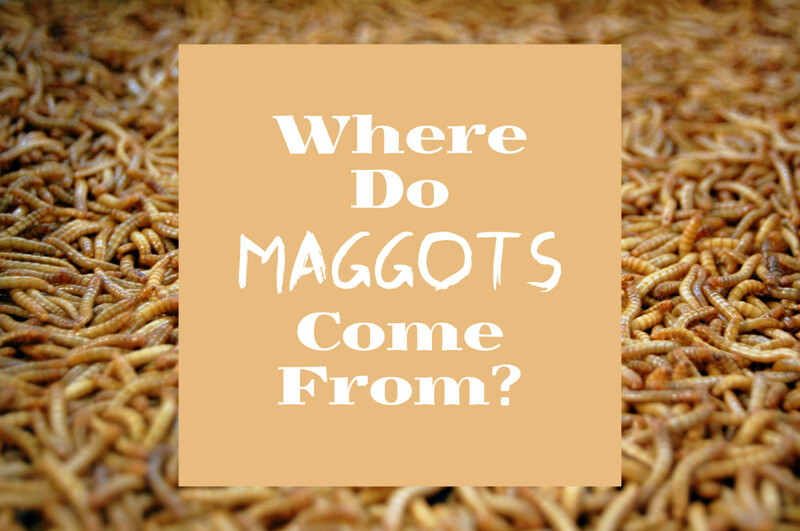 Breeding grounds include the obvious ripening fruits and vegetables that may be left out of the refrigerator. Put those fruits and vegetables that can be refrigerated away and keep those that cannot be chilled under a fine mesh cover to prevent the flies from getting to the fruit. Check potatoes and onions you have stored and if possible store potatoes in a potato bag and onions in a fine mesh or hessian sack. Wash dirty dishes immediately after use or stack in the dishwasher and close the door! Other less well-known breeding places can be in the waste disposal units and drainage pipes of sinks. Ensure that these are kept clean and sanitized. If your sink is draining slowly, this could be a sign that the sink trap is getting blocked with organic matter that could provide a breeding ground for flies, so get it cleared so that it runs freely. Make sure your garbage bin is one with an automatic closure so that it is never left open for flies to get in and lay their eggs. Surprisingly anywhere damp can also provide somewhere for Momma fruit fly to lay her eggs. This can even include the sponge head of your floor mop and cleaning cloths if they are stored damp. If you have recycling bins for bottles, cans and plastic cartons, make sure everything is washed clean BEFORE your put it in the recycling. After some experimentation, I have found that the inverted cone trap with a bait of apple cider vinegar with a few spots of dishwasher soap added is the most effective way of killing fruit flies. 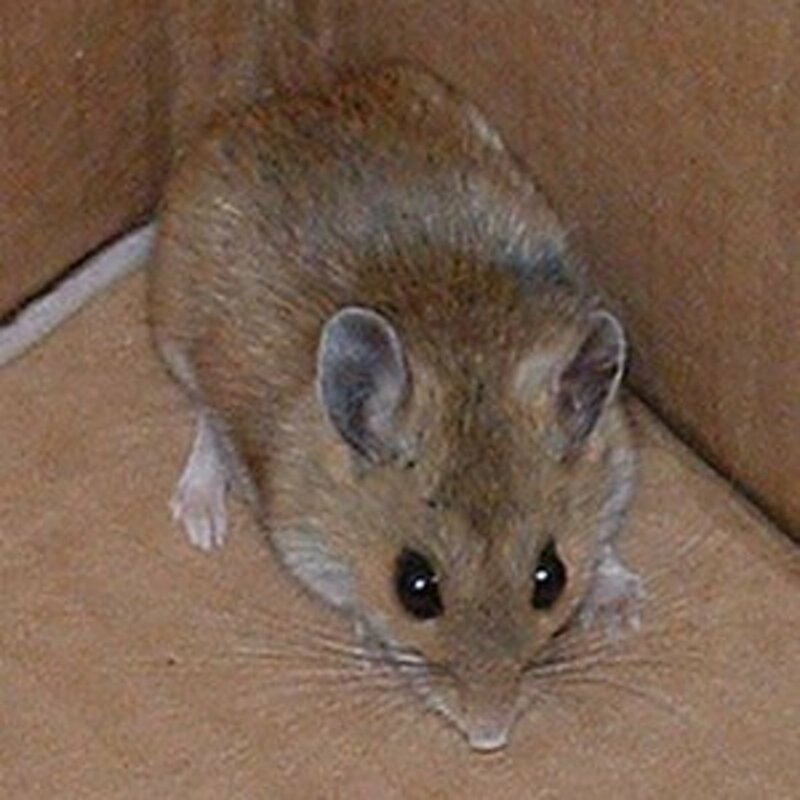 Empty the trap by flushing the contents away and re-bait when the trap gets too full. Preventing further infestation is equally as important as killing the flies you already have and taking care of the preventative measures I have outlined is the best way to get rid of fruit flies permanently so that you only ever have a few 'strays' to deal with. Hi Kristen, thank you. Yes, it doesn't matter what brand of ACV you use in my experience. Great tips, Allison. I would keep this in mind. Would any generic ACV would work to bait the flies? Just wondering. I hate fruit flies! MJ, thanks for your comment - turning the top of the bottle into an inverted cone for your fruit flies trap really works - the little rascals climb up the sides of the bottle looking for the way out and hardly any of them get back out through the bottle neck! I'm afraid the hub hasn't been written yet for training husbands! Too much of a challenge, I guess! Heidi, thanks for your comment. We have a food recycling caddy in the kitchen as here in the UK, food waste, veg peelings, etc. are collected weekly. We have a little one in the kitchen which we decant into a larger one in the garden which helps - but fruit flies would definitely be a pest if we didn't take action! This has been an issue at our house since we've kept a small compost pail (covered) in the kitchen. We've moved it to the garage (which is inconvenient). Thanks for the tips! I'll have to try 'em. Thanks MPG Narratives - hope Australian fruit flies like cider vinegar as much as ours do! This is great, we are heading into summer and with all the lovely summer fruits come these pesky fruit flies. I will certainly be using the apple cider vinegar and dish soap. Thanks for sharing your tips Alison. Voted up and useful. Good advice. One year these pesty things were all over. We couldn't get rid of them. This hub would've been great! Thank you for sharing! Thanks so much Peggasuse, it is always good to get a personal endorsement - yes, it really does work doesn't it and the drop of dish washing soap makes it even more effective. You know, I tried this last year, and it really worked! My son-in-law read it somewhere on the internet and at the time, we were getting a lot of gnats. So he poured some apple ceder vinegar into a shallow bottle with a large mouth, and left it on the counter. A few days later, it was full of dead bugs. I was so happy that they were in the jar, instead of flying around the kitchen and all through the house, like a gang in a war. Thanks allpurposeguru - these little flies really are a pest, my dog hates them in the house too! I wish I had known about this a month ago. I hardly ever print hubs, but this one is going in my collection.